I've written about the surveyor John Hales in previous posts. His Survey of Boston (Boston: 1821) provides an invaluable look at Boston in the years preceding the switch to incorporation as a city. Hales and his partner William Taylor surveyed all of the streets of Boston in 1819 and 1820, which resulted in a large format atlas (Maps of the Street-Lines of Boston, Made for the Selectmen in 1819 and 1820 by John Groves Hales, Boston: 1894)) of every street in Boston. This atlas is difficult to find (I'm fortunate to have two copies) but if you're extremely, and I mean extremely, interested in Boston it may well be worth the $200 or $300. For completeing this project, Hales and Taylor were paid $700 by the town. I assume Hales published his small format Survey of Boston (another hard to find book, but much more fun than the large atlas) to profit off some of the work he had done for the town. 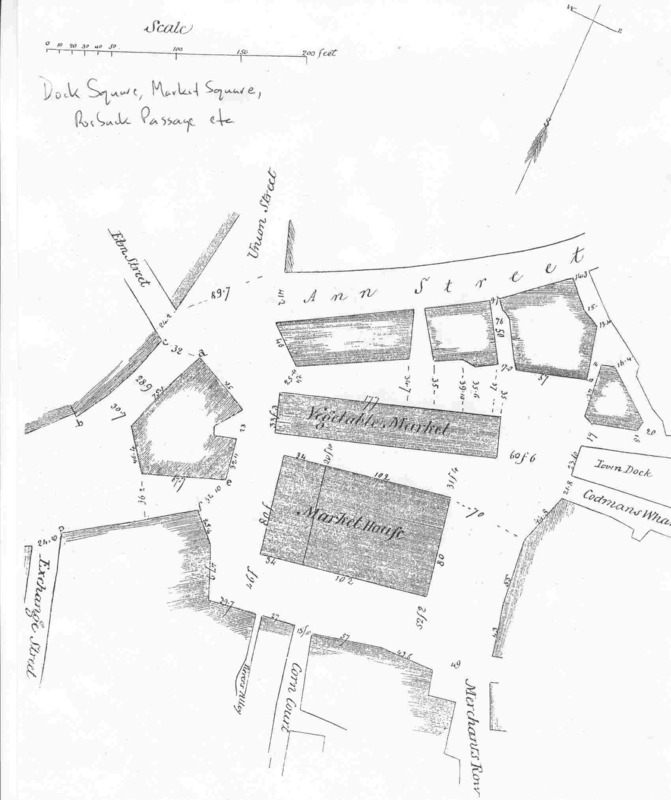 Today's post takes us on a walk around Boston's periphery as it was in 1821. Clicking on Roebuck Passage here or below will take you Hales' survey of that area. When viewing the image, please note that the Market House is Faneuil Hall, and that Quincy Market is still a few years in the future and will be built on land that has yet to be filled. Union Street and Merchant's Row still exist today. Ann Street is now North Street. Roebucks Passage is in there somewhere between Ann Street and Merchant's Row, but is unlabelled.